DKH10: Handa. Nr.32. Ca.1945-50. Price: € 3.00. This deck is ready for discarding. 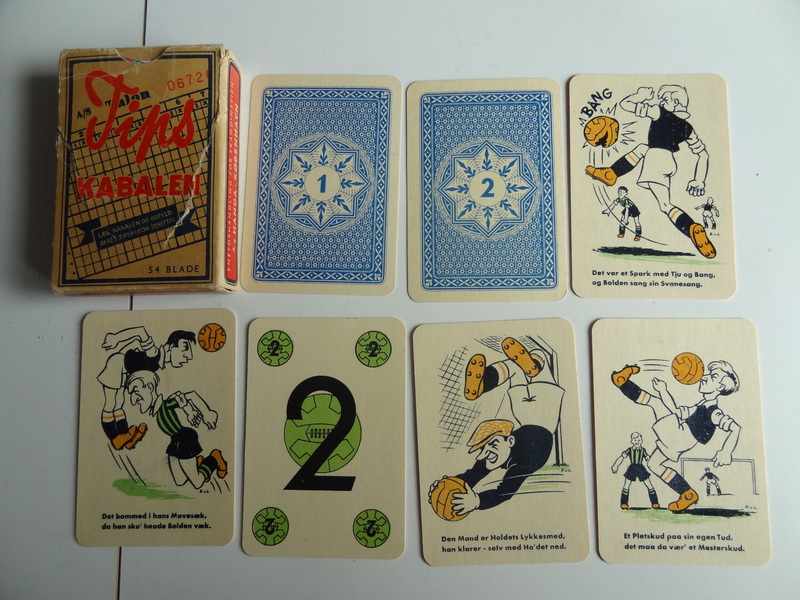 BUT: The first deck from Handa came in 1944, and this is the second/third version from ca.1945. Simple colouring. Queen of Hearts with dark hair, AND the King of Cubs with an axe, instead of the later sceptre. 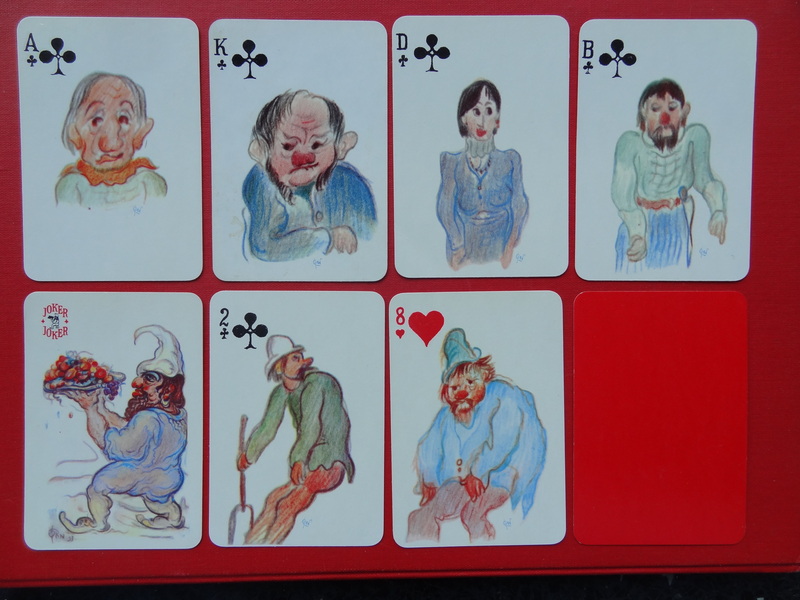 51 cards+ joker, King of Hearts missing, no box. VERY VERY much dirty, broken and with rifts, – but funny/interesting: The deck has been “shaved”, i.e. sent for rejuvenation, where the corners and edges have been “shaven” clean. Therefor the rounded, irregular shape. DKH11: Handa. Nr.717. Ca. 1965. Price: € 4.00. . 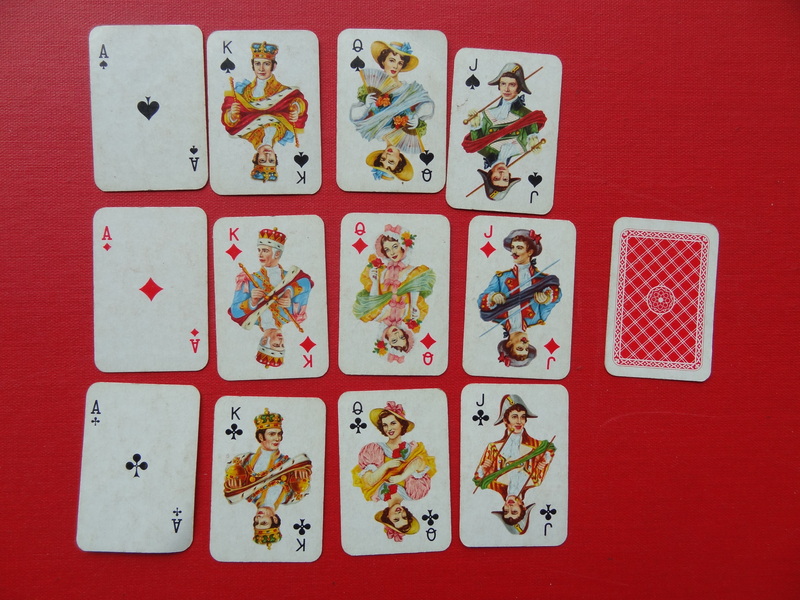 This is the most common and well-known version of Handa decks, – but still: This is a linen-version, i.e. 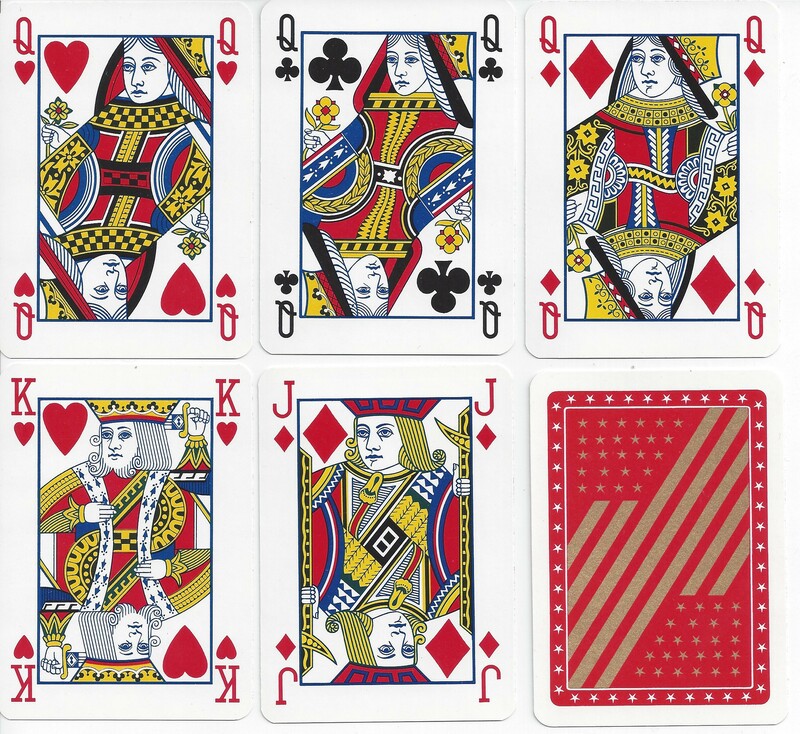 with a structure like linen, – and then it is an unusal combination of court cards and back pattern. Furthermore the pips are special, especially the E for Es (Ace). 52 little used deck, no joker, no box. DKH12a: Baby Size. No.85. Price: € 1.00. Used deck, with two jokers, Diamond 3 and 9 are missing, defect box. 4½ x 3 cm. DKH12c: Pris: Kr.25.00. Samme spil, med blå ryg, brugte, 1 joker, ingen æske. 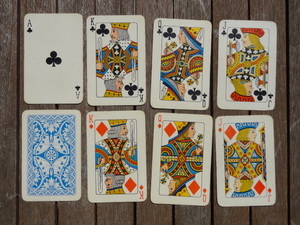 Same deck, with blue back, used, 1 joker, no box. DKH12d: Price: € 3.00. 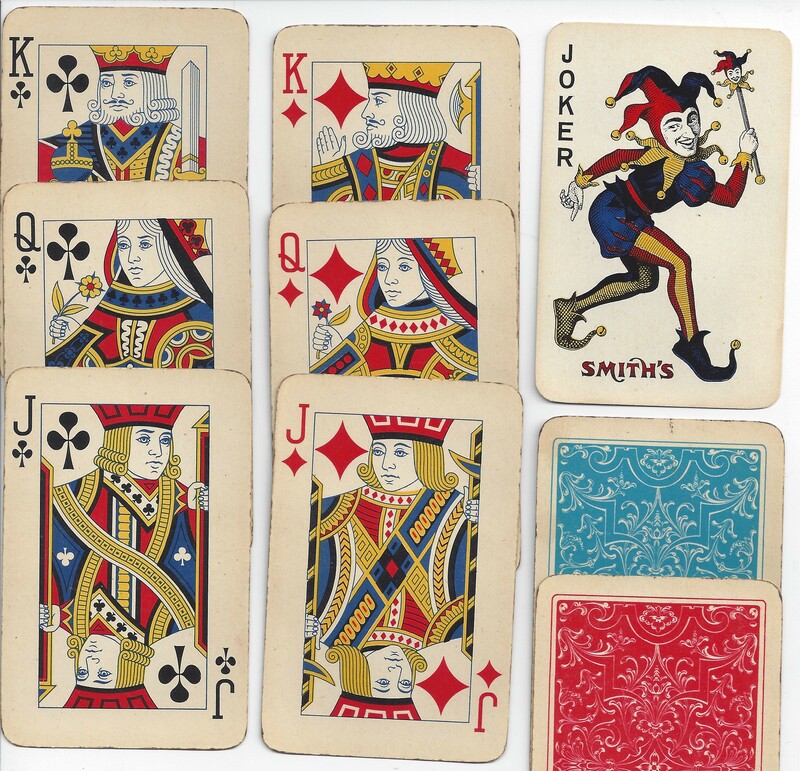 Same deck, sligthly used, in box, 2 jokers, Queen of Diamonds missing (written on a joker). DKH13: Bridge. Spillekort. No.7485. Ca.1960. Price: € 5.00. The Berlin Pattern, slightly used, in much defect box, 2 jokers. DKH14: Turist-serien. Frederiksborg Slot. Price: € 2.00. Worn deck. Linen finish. No jokers. No box. DKH16: Turist-serien, Kronborg. Price: € 2.00. 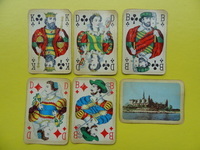 The company Handa in all published 10 decks with tourist motifs = Danish castles and the like. Most are from the 50s. The design was of three different kinds, + several variations. This is with the standard Handa pattern. 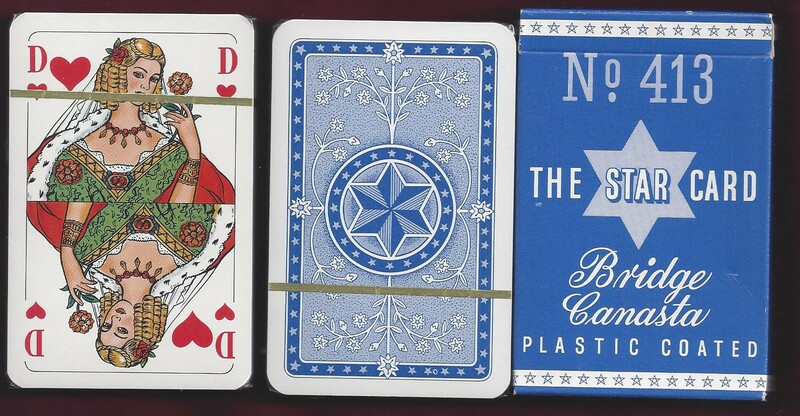 52 cards, no joker, no box, worn. DKH18: Bridge. No.555. CA.1960. Price: € 5.00. Standard Berlin pattern. Slightly rare deck. Yellowed in use, but otherwise well preserved. With one joker (one missing). In original box. DKH23: Bridge, No.444. Price: € 2.00. An early version, based on the feel of the paper/cardboard, published around 1950. 52 cards, 1 joker, 1 blank. All worn and in defect box. DKH29b: [Petit. Ivory surface Whist. Nr.1001]. Price: € 4.00. 52 cards complete, used/worn, no box. DKH29c: Petit. Ivory surface. Bridge. Nr.111x. Price: € 2.00 /each Two decks. Blue with two jokers, red with one joker. Both decks are much worn and in defect boxes..
DKH30: Patience. 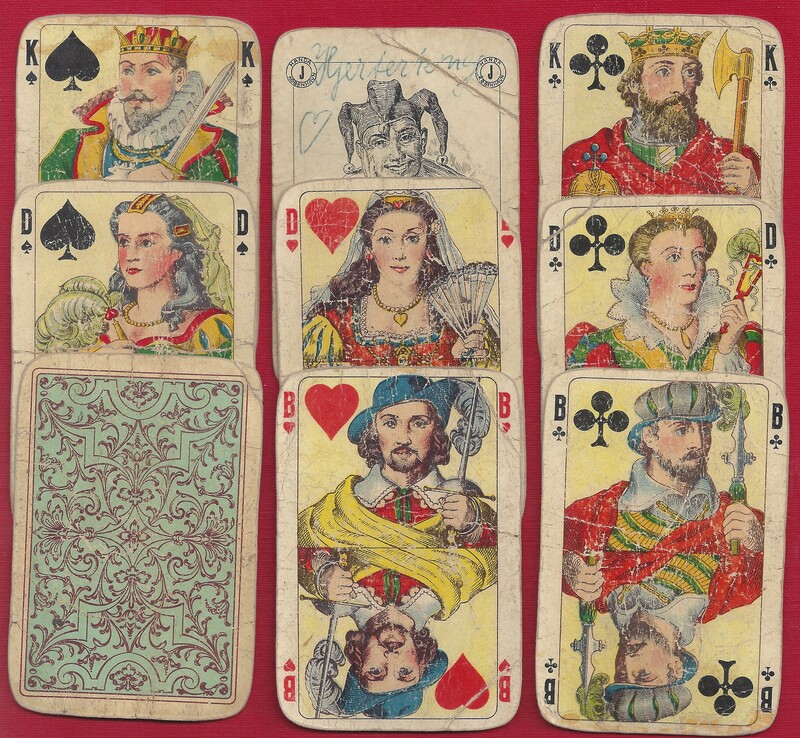 Price: € 6.00 Patience-deck from before 1949 as can be seen by the green tax stamp on the Ace of diamonds. Size 6,2 x 4,2 cm. The cards are yellowed, but nice. 52 cards, no box. I have both a blue and a red deck. DKH35: Royal. Whist. Price: € 3.00. From the beginning of the 50s. Two jokers missing. Worn deck in broken box. Not that easy to find. DKH45: Rococo De Luxe. No.111. Ca.1950-60. Price: € 1.00/each. Two versions. Big and small pips. Both decks are worn and dirty. 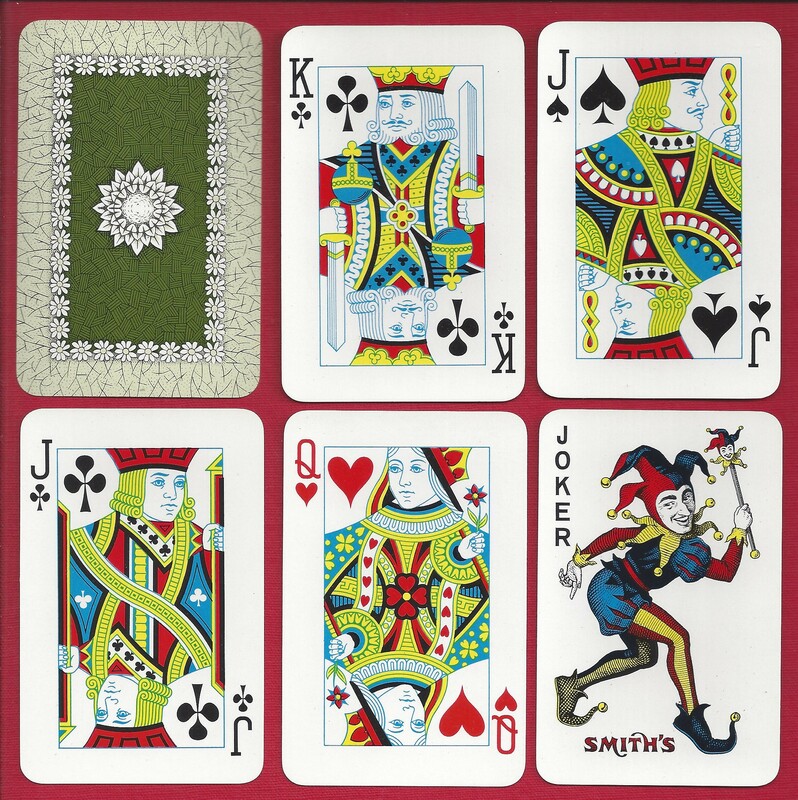 The left deck has no joker and no box – The right deck has two jokers, and a defect box. DKH53: Standardbillede. 60-70erne. Price: Total € 2.00. Two worn and dirty decks. 2 + 3 jokers, no box. DKH54: Standardbillede. 60-70erne. Price: € 2.00. Two worn decks. Double deck in plast box. DKH55: DFDS. Danish Playing Cards, No.1001. Price: € 3.00. Deck from the 50s. 52 worn cards, in worn box. DKH57: DFDS. Danish Playing Cards, No.1001. Price: € 6.00. Deck from the 50s. Unused, with nice golden corners. Worn box. DKH63: Axel Ørn. 1965. Price: € 20.00. Special product, privately designed, by Handa. It came with either a red or a black reverse, in very limited amount. All cards are illustrated by the artist. Unused deck, no box, 1 joker. DKH66: Kabale. Årobably from the 60s. Price: € 1.00. Patience. Probably printed in Belgium. 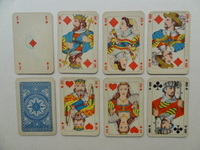 8 of Spades adn the King of Hearts is missing. No box. Used. DKH87a: Det Forenede Dampskibsselskab. No.1001. Price: € 1.00 Two different versions. Left deck, worn and no box, no jokers. Right deck SOLD. DKH87c: Price: € 6.00. I also have an unused deck in original wrapper, unopened, – so I do not know which version it is. DKH92: Rokoko. Price: € 5.00. Two version of pips, E,K,D,B and A,K,Q,J. One deck with two jokers, the other with one. Slightly worn. In non-original double box. DKH93: Rokoko. Price: € 4.00. Small pips E, K, D, B. No box. 52 cards, slightly used. DKH95: Luxus Salon Kort. No.99. Price: € 1.00 / Each. 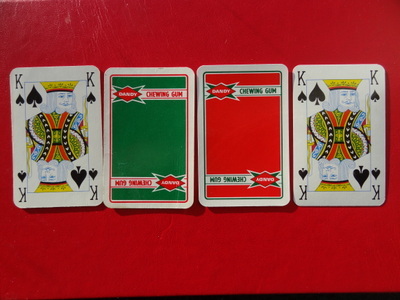 Green deck, A,K,Q,J, very much worn, in box, no jokers. Brown deck, E,K,D,B, much worn, no box, no jokers. DKH96: [Luxus Salon Kort] No.99. Price: € 1.00. First published ca. 1955. 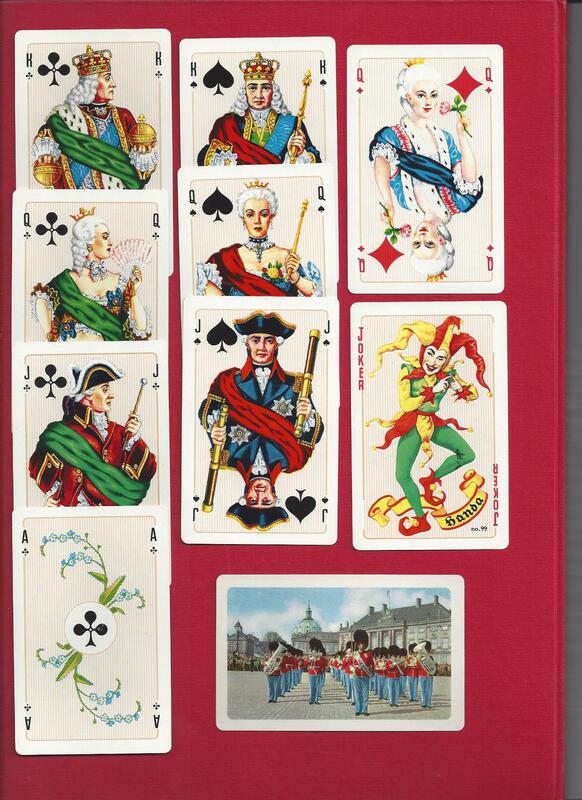 52 yellowed and worn cards, nice box, Rococo illustrations. DKH98: The Star Card. No.413. Price: € 4.00/each. I have two decks, with red and with blue reverse. Unused, unopened plast, in box. DKH104a: Dandy. Price: € 3.00. Used double deck in plast box. Each with 3 jokers. Probably printed in Belgium for Handa. 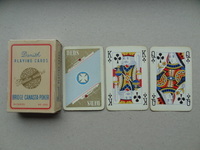 DKH104b: A similar double deck, used, no jokers, no box. Prisc: € 1.00. DKH104c: A similar single deck, sligtly used, no joker, no box. Price: € 1.00. DKH114: Danish Souvenir Series. The Amalienborg Castle. The Royal Guard. Ca.1955. Price: € 40.00. 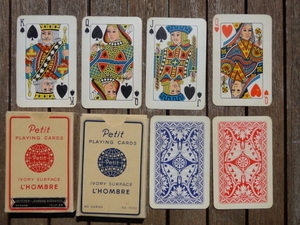 Rare deck belonging to the Tourist Series. 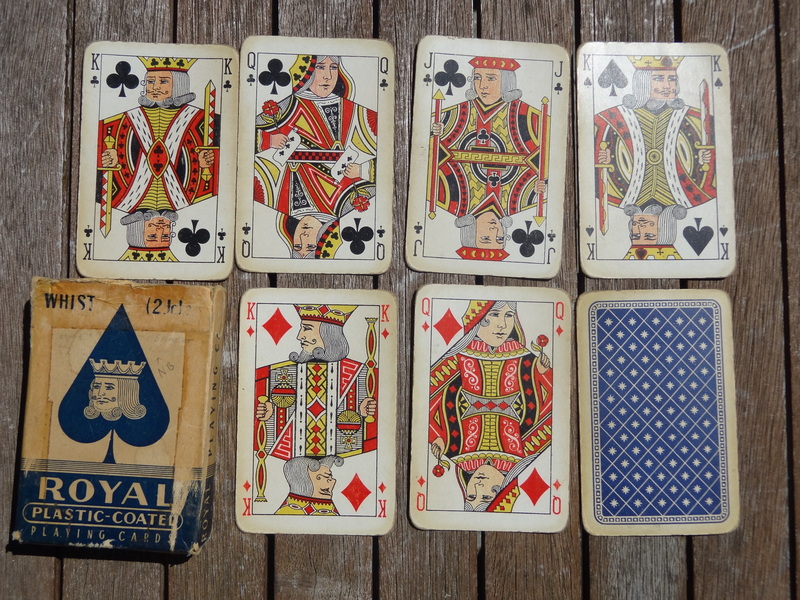 Rare, because the Queen of Diamonds is REVERSED (see DK95 and DK102). The deck is unused. Two jokers. English pips A, K, Q, J. No box (it is in a box for Rosenborg Castle). RESERVERET DKH115: Danish Souvenir Series. The Rosenborg Castle. Ca.1960. Price: € 2.00. Only the 12 court cards. Mint. DKH116: Pin-up Joker. € 1.00. One single card. Near mint. DKH117: Pin-up Joker. € 1.00. One single card. Near mint. DKH122: H. C. Andersen. ca.1955. Price: € 20.00. With the well known drawings by Vilhelm Petersen. This game is INCOMPLETE. 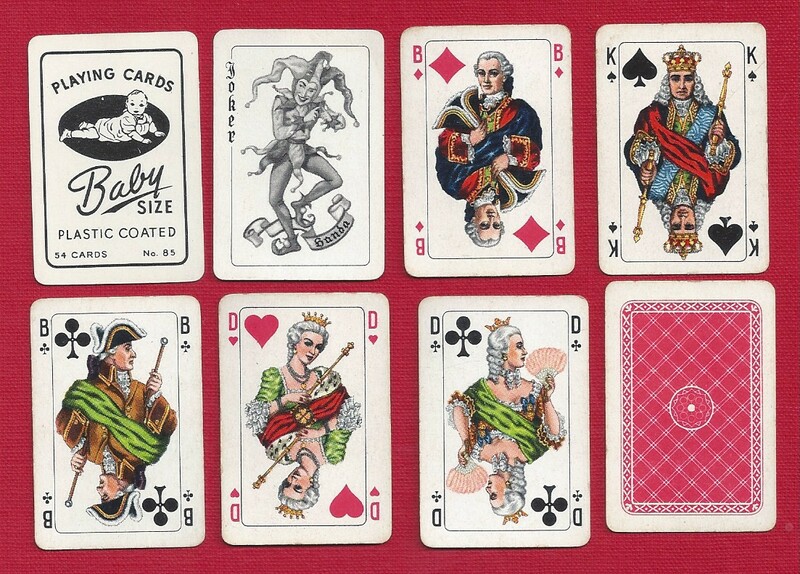 Of the more important cards the King of Hearts and the Ace of Spades are missing, and of the 36 other cards there are only 20. On the other hand: The cards are all mint/unused. The collector of these cards originally had them directly from Handa, as surplus cards from the production, – for which reason there are number codes on some of the cards. I have duplicates, but have here assembled as many different cards as possible. DKH123: Nr.99x. Price: € 20.00. Unused deck. 1 joker. No box. Pips are the English A, K, Q, J. BUT: The special thing is, that there are only two pips. That is fairly rare. DKH125: Exclusive Empire. Ca.1980. Price: € 6.00. Unused cards in nice box. 2 jokers and a text card. Printed by Carta Mundi. Danish Design. I have the same deck with blue reverse. DKH127: HK-Ungdom. København. Ca.1989. Price: € 6.00. Unused deck in box, with three special jokers.